One of the things that makes bowhunting so appealing is that it's so difficult. That's why I love the challenge of hiking into the middle of the wilderness with nothing but my pack and my bow. As a bowhunter, you need complete faith in your physical ability to hike in to your hunting ground, stalk your prey, pull your bow stealthily and pack out your animal. That means it's essential to train for your hunt. Whether you are a whitetail hunter trying to get more speed from your bow by pulling more weight, or an elk hunter trekking through the top of the Rocky Mountains, physical strength and endurance is vitally important. If you are an average hunter like me, you save up what few vacation days you have each year to spend time in the woods. You spend all year thinking about those one or two big hunts. Don't you owe it to yourself to make sure you have the best opportunity for success? 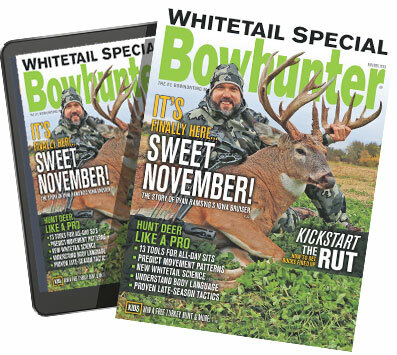 You would never go hunting without tuning your bow to precision, yet most bowhunters don't think about training their body prior to a hunt. Proper training will lead to more consistent success, a more enjoyable hunt and the ability to hunt hard long after your hair turns grey. The exercises I've developed below are designed specifically for the needs of bowhunters. They'll help you gain more leg and core strength, which is grounded by strong glutes and hamstrings, you'll be able to pull a 5-year-old buck out of the weeds to field dress it, or haul yourself up the tallest peak to scope for game. Increasing your lower body endurance will enable you to hike farther and faster, covering more ground to reach the trophy you're after. You'll also shoot your bow straighter and with more consistency when you train your core, which increases your shoulder strength and stability. You will attain the upper body strength to smoothly pull back a heavy enough bow to bring down a brown bear. All it takes is two, 40-minute workouts per week to master these 10 essential workout routines for bowhunters and to improve your chances for success this year. Adam Holt lives in Denver, Colo., and has been a personal trainer and strength & conditioning coach for 11 years. He's worked with many athletes, from the high school to professional level, in a variety of sports. He was introduced to bowhunting four years ago by his uncle; now it's an obsession. He's passionate about helping other bowhunters enjoy the sport through better fitness.